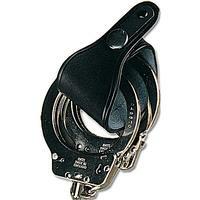 This simple economic handcuff loop is ideal for most types of handcuffs, weighs just 31 grams (1.1 oz) and is suitable for a belt up to 2 inches (5 cms in width). The 'one way' press stud has to be opened the dot side first and fastened the opposite way. Handcuffs in the picture are just there for illustrative purposes!